In this article we will learn how to retrieve the data into xml form or in other words you can say how to get table data into xml and Json format. Select table data into Json and xml form in SQL server. 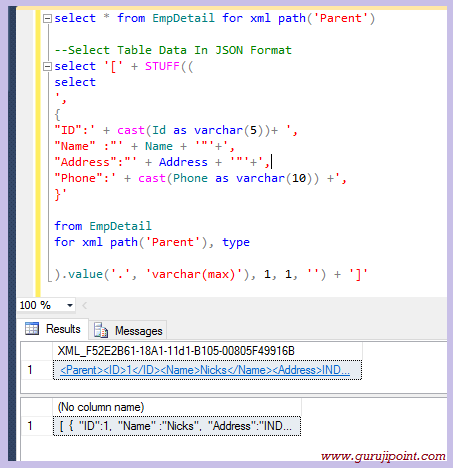 Simple sql server inbuilt function for return and display data into JSon and xml format. In previous articles we have learnt Showing Bind multiple dropdown list using single method call using c#. Read Excel file in C# And Display in Grid. Read Excel in Windows Application project. Chart With Database In Asp.Net Using C#. Insert Only Numeric Values In Asp TextBox Using Regex . Get TextBox , Dropdown, CheckBox control Values In Aspx.cs Page From User Control Using C#. You can achieve this by using single line statement. And this statement generates a XML of whole table records for you. Many time you need to display or retrieve the data into XML forms When you are working with any Web Application and Web service project this any be your one of the most required thing. I am sharing this code because i face the same type of problem in front of me and when i search i didn't find any running solution to quick. In my scenario i have a Web Service project and i need to generate a soap request for that project. So by using this i can able to generate the XML for that project. Few modifications over there but here is an sample for you. In the above statement i used 'Parent' as Parent Node name for xml, you can replace this name as per your requirement.